Creating beautiful Old Westbury Gardens wedding photography is always a joy. I truly believe that you can make compelling wedding images anywhere, but it really does help when the deck is entirely stacked in the favor of the wedding photographer! If you ask me what the most important thing is when creating a compelling wedding photograph, I would say "the moment." I firmly believe that. To take a wedding photograph from good to great, there has to be a moment occurring. Whether it’s a moment between a couple on their wedding day, a bride’s father seeing her for the first time, a mother watching her son get married, or even just a quiet look in a bride’s eye during a bridal portrait, a compelling moment will elevate a wedding picture to a new level. This image has a compelling moment. Yes, it’s just a simple bridal portrait. You might be asking yourself, "Where is the moment?" It’s in the excellent engagement of the bride with her pose. It’s in the beautiful arch of her neck and presence in the moment of the image. The moment can be a quiet one, it doesn't have to be tears or wild laughter. It can be in the swoop of a dress, the flutter of a veil, a quiet second alone. After a moment, an image needs light. Sometimes it’s flat light, because it’s been raining or the clouds are covering the sun. Sometimes the light is flat because you’re in a shady area, indoors, or away from a direct light source. In this image, I really needed bright light. I had placed the bride in a huge, vast area in Old Westbury Gardens. I needed something to separate her from the business of the background and her surroundings. The best way to do this was with the lighting of the portrait. The bride is lit by the direct sun, which creates a beautiful halo around her face and body. This serves to separate her from that busy background. This image would not look the same had it been lit by a flat, indirect light source. I am always considering how the way I light a subject or scenario helps tell the story. Imagine this image without the gorgeous bright light burning through the umbrella. It wouldn't have quite the same impact!An image also needs a careful composition to have maximum impact. 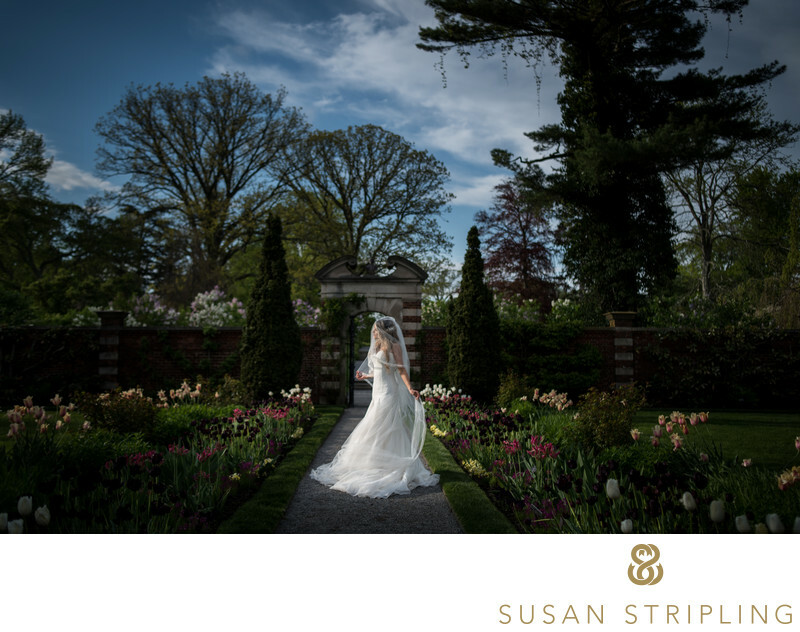 I chose to place the bride as a small figure in the bottom of the frame to emphasize the vastness of Old Westbury Gardens around her. 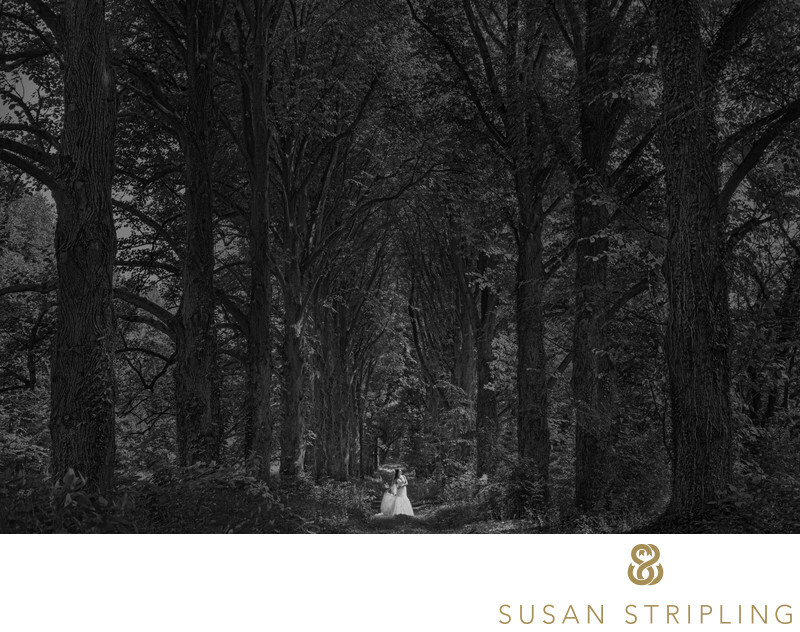 By placing her in the lower part of the frame, the leading lines of the trees bring the eye of the viewer directly to the bride. 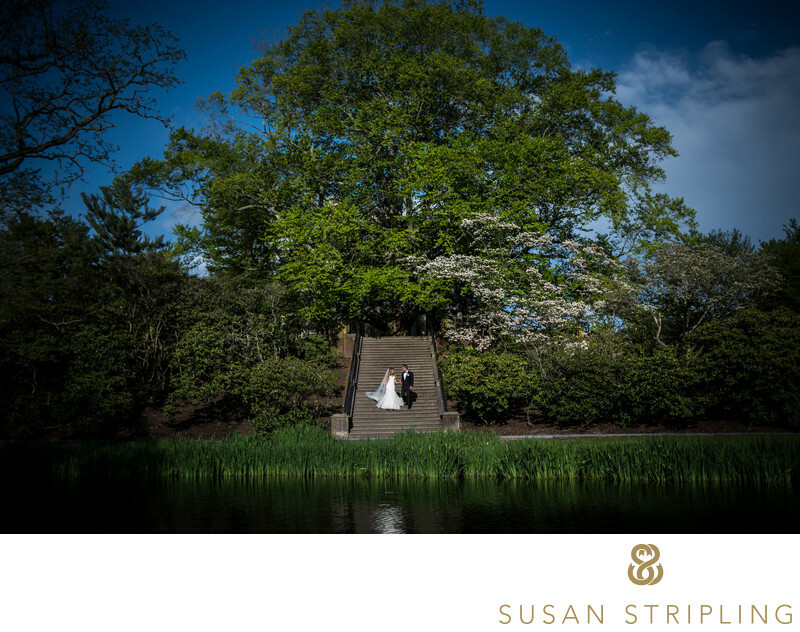 Old Westbury Gardens has many delicate, subtle areas for wedding day photography. I chose this location for this portrait because it was bigger, wilder, and more vast. 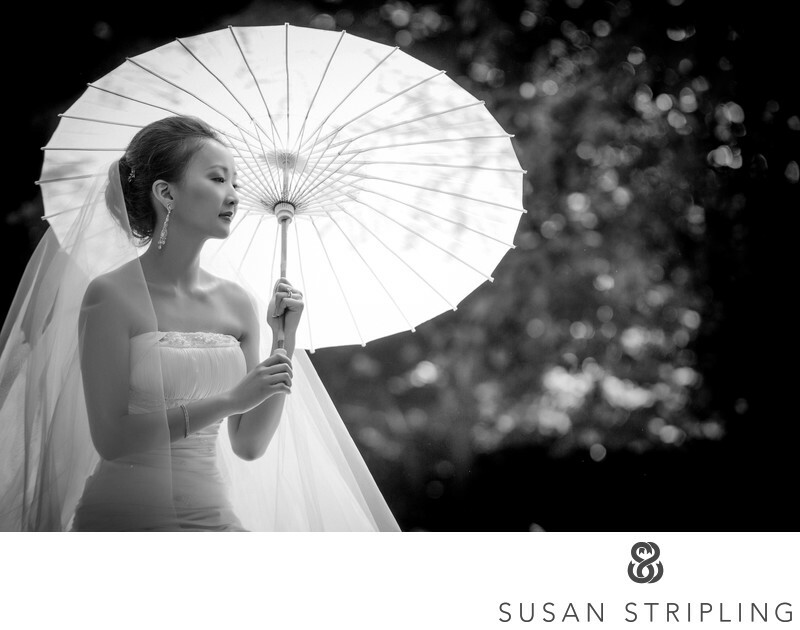 It served as a great contrast to the more close-up, location-aware bridal portraits that I had taken already. When creating Old Westbury Gardens wedding photography, I want to use the space to it’s best advantage. This involves using the light, the surroundings, and the scenery to create a robust gallery of images for discerning brides and grooms. 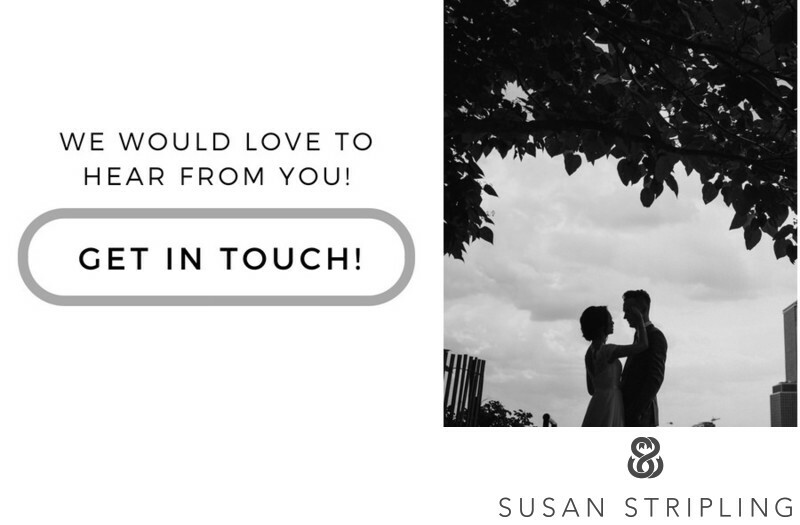 Whether your Old Westbury Gardens wedding photography involves portraits of you two together, family formals, or bridal party images, I will strive to do the same thing for you. My end goal is your gallery of wedding photography that will illustrate the love you have for each other, the beauty of your surroundings, the grace of the moments between you, and the elegance of the gorgeous gardens. 1/200; f/4.0; ISO 100; 55.0 mm.